It feels like there's not a building in Europe which doesn't serve Costa, usually in several places at once. This is certainly the case on the motorways. The brand started in London in 1971, and by the early 2000s Costa Coffee and its slogan at the time "Italian about coffee" was becoming a familiar sight in most town centres and shopping centres. In 2018, Whitbread sold Costa for £3.9 billion to Coca Cola. The BBC News has coverage of this sale. The prices charged at Costa are set by the franchisee, and on the motorway these tend to be heavily inflated. The fact people continue to pay may explain why so many Costas have opened up near the motorways. Roadchef were the first operator to introduce Costa to their motorway services, replacing Cafe Continental, as part of a nationwide investment programme. It joined Wimpy and rivalled Granada's relationship with Caffe Ritazza. A few years later Moto followed by replacing all their Caffe Ritazza outlets with Costa. Welcome Break, who had been keen to be different, eventually adopted Starbucks and were keen to stress that this sets them apart, however they now offer Costa Express too. Over the years the availability of Costa has spread from being tucked away in an old unit or a stand next to the restaurant to being served outside the entrance, in the restaurant, from a portable stand, in the shop and in the petrol station - usually all at the same time. The lounges have become increasingly stylish as the image of service stations and of Costa has changed. Many services now rely on Costa's menu only to meet their obligation to provide food 24 hours a day. In July 2016, Roadchef opened their first Costa drive thru, in a similar style to Welcome Break's Starbucks drive thrus. More are expected to follow with both Roadchef and Moto. Roadchef were the first to change their operating logo to read 'Roadchef Costa Coffee', sneakily allowing them to advertise Costa from the motorway. Moto later decided to go one better, changing their headboard to 'Costa M&S' or other variants. Many former Esso On the Run stores used to include a Costa café, where you could pay for your fuel at the same time. These all closed by 2015 and many have been replaced by Subway and Greggs at Euro Garages sites. Through its relationship with Moto, Costa has become a popular choice to replace former Little Chef restaurants. However, Euro Garages are currently the fastest-growing operator in the industry, and as Euro Garages use Starbucks, Costa has begun to take a back seat in this field. In July 2016, Roadchef were the first operator to introduce a Costa Drive Thru unit to a motorway service area at their Rownhams eastbound site. One has also opened on the westbound side since and now opening at other Roadchef sites. Then, in April 2017, Moto also introduced a Costa Drive Thru to their Reading eastbound site and they are rolling it out to other sites too. Unlike the Starbucks sites, all of these Costa drive thrus don't offer any seating. It is being included in many new service station proposals. 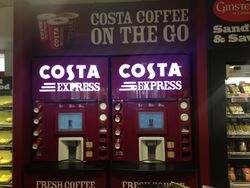 A pair of Costa Express machines. In March 2011 Whitbread, the then-owner of the Costa Coffee brand, purchased Coffee Nation with the intention of re-branding it as Costa Express. Coffee Nation was a brand widely seen across motorway service areas providing coffee machines within petrol forecourts and WHSmith outlets. They are also seen at most A-road services. Costa Express machines now offer five varieties of hot drinks and are the largest coffee machine provider for forecourts in the UK. Their widespread use allows a large number of petrol stations in the UK to be classed as a full service station by providing the key requirement of serving hot drinks with very low running costs. During mid 2018, Welcome Break started to phase out the use of Costa Express at their sites in favour of Starbucks on the Go machines.